Grading on the crazy curve. There’s grading on a curve and then there’s grading on a rollercoaster of personal emotion that no one really understands. Writing for the Forbes contributor network and lightly used baboon replacement heart refurbishing center, Jay Somaney doesn’t realize he’s just auditing this class, not teaching it. 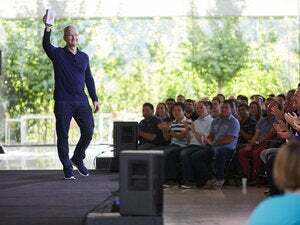 How exactly has Tim Cook fared in the five years since he has been the CEO of the world’s most profitable and valuable company? On a scale of one to boogers, how well would you rate Tim Cook? However many minutes you can hold your hand in this Dune pain box will be your rating of Cook’s performance. Gee, that wasn’t very long. You must think Cook’s a terrible CEO. …which is the performance of the shares under his stewardship. As Somaney points out, Apple’s shares have gone up massively, but not as much as the NASDAQ. Thus, below-average performance. No need to discuss Wall Street’s perennial misunderstanding of Apple or Apple’s ridiculously low price-to-earnings ratio. Also the fact that it handily beat the S&P 500. Certainly not at all noteworthy. C for market performance. Okay, let’s examine the next area that a CEO should be graded on. As they say, a CEO is only as good as the people he/she surrounds himself with. This is not really a metric. It’s just an excuse for Somaney to scratch his persistent itches despite his doctor’s continued warning that he’s going to infect that. Because I’ve basically been complaining about the same nonsense for months. Cook has admitted that Browett was a mistake. But irrespective of that, this whole tic that Somaney has of trying to bash Cook over the head with his hires to show “he’s no Steve Jobs” ignores the fact that Steve Jobs did exactly the same thing when he hired then fired Mark Papermaster. Presumably that was Cook’s fault as well. Everything, when you get down to the root cause, is Tim Cook’s fault, from falling iPhone sales to the cancellation of Firefly. Cook also hired now-CFO Luca Maestri, who is incredibly capable and sounds amazing on every single quarterly conference call. But we’re only looking at the “two people and two people” Somaney wants to complain about. Somaney believes that because we haven’t seen Ahrendts do anything, she must not be doing anything. Presumably because he does not have object permanence and nothing that happens outside his field of vision exists to him. Hmm. “Most people” think that $3 billion was too much. Does that include the executives at your beloved Google who acquired Motorola for $12.5 billion only to sell it to Lenovo for $2.91 billion? If Cook gets a C on acquisitions based on this one moderately big buy, what must Somaney think Google should have gotten? Ultimately, if Cook were really only providing a C- performance it doesn’t matter. Graded on that scale, anyone else would be turning in an F.